Founded in June 2012, Hong Kong-based PassKit, a startup that enables customers to create mobile wallet passes for both iOS and Android devices has just concluded its $1.2 million series A funding from undisclosed investors. 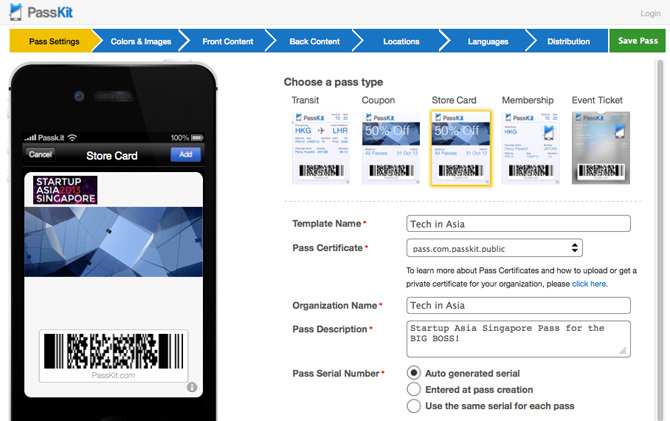 Specifically, PassKit claims to be the first ‘what you see is what you get’ (WYSIWYG) interface and Passbook designer (see image below) on the market, which allows geeks and non-geeks to design and publish their mobile coupons, boarding passes, and event tickets in minutes. To date, it has helped its users issue over 250,000 passes globally. The statement also shared a case study where the franchise owner of Subway Hong Kong saw 10,000 of its passes issued in 24 hours. We were first to market with a Passbook Designer which empowers anyone to create a pass and launch a mobile marketing campaign in just a few clicks. We have already issued over a quarter of a million passes globally and our cloud-based solution can easily scale up or down depending on demand. On a related note, PassKit’s Indian counterpart who just graduated from 500 Startups, WalletKit, also provides a similar service. But the team at WalletKit has relocated to San Francisco which means its targeted markets are slightly different. One is based in and aimed at the U.S, and the other is focused on Asia.